Correspondence No. 14979/Admin/M/F/17 is an issue by the office of Chief Executive officer District Education clout Jhelum dated 22-12-2017 apropos English Language PEELI Training for Head Teachers of Punjab Primary Schools. This letter is on paper to all head teachers of key schools District Jhelum. 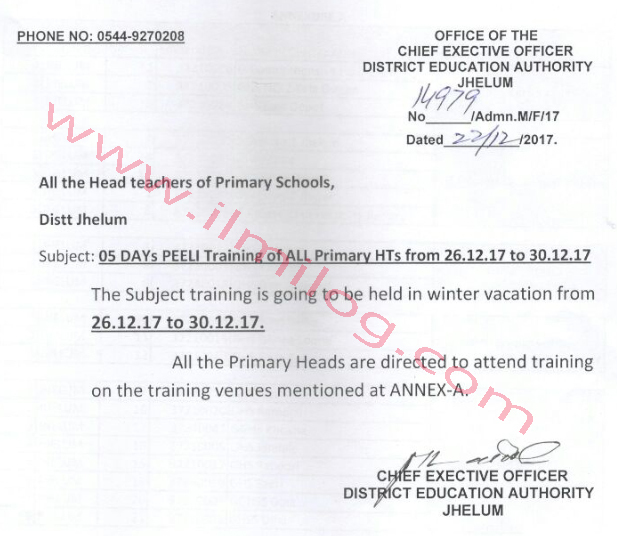 Subject: 05 days PEELI Training of all Primary Head Teachers from 26-12-2017 to 30-12-2017. All Primary Head Teachers are heading for to attend a gathering on the training venue. 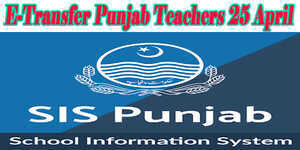 PEELI stand for Punjab Education and English Language program. It is well-known in 2013. Punjab Education and English Language initiative PEELI means in close teamwork with the Punjab Government School Education and Directorate of Staff Development is changed as QAED (Quaid-E-Azam Academy for Educational Development) to sustain the chief minister's tutoring alteration roadmap and develop the superiority of teaching in primary and elementary schools in all 36 districts of Punjab by British council. Punjab Education system is one of the largest public education systems in the world. British council provides training resources and self-directed learning opportunities not only for teachers and teacher educators but also for district officials and head teachers. This inclusive approach helps to encourage and embed good classroom practice. In December 2015, the British Council signed a memorandum of understanding with the Government of Punjab which provides for a significant expansion of PEELI over the next three years As a result of 2019, we aim to have helped an estimated 300000 primary and middle school head teachers reach their potential and develop the knowledge and skills required to deliver world-class teaching in Punjab. PEELI's ultimate aim is to provide stronger student learning outcomes (SLOs). This can only be achieved by improving the quality of teaching.